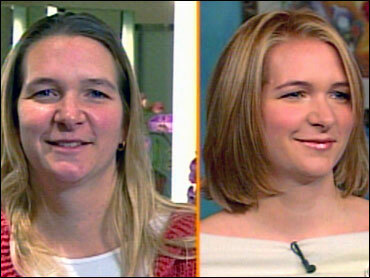 A few weeks ago, viewer Wendi Hauck was a finalist in the "Putting it Together" makeover contest. Although she didn't win, The Early Show wanted to make her Thanksgiving a little brighter. On Monday morning, stylist David Evangelista, at the John Barrett Salon, transformed Hauck's look from head to toe. Although Lori Brengle won the "Putting It Together" contest, Hauck, a 32-year-old stay-at-home mom, was a very close runner-up, garnering 24 percent of viewer's votes. As because it's Thanksgiving week, The Early Show gave Hauck something to be hankful for this year. In her contest-entry tape, Hauck showed her off a wardrobe consisting of numerous pairs of overalls, and said that if she doesn't get a makeover, that's all she sees herself wearing for the foreseeable future. She said she never wears makeup and has had the same hairstyle for over a decade, so she hopes to win the makeover to make a complete change. Evangelista explained the transformation Monday morning. He says, "We were at the salon this morning and they put the amazing golden highlights in her hair. We brought her length up a lot. I thought from the forehead down to her nose, her face was a little long and I wanted to proportion that out and did that with the length and put light layers in. As for her makeup, Evangelista says since Hauck is not used to wearing makeup, he wanted give her a soft, natural look to make it easy for her to do at home. The makeup artist gave her light glossy lips and applied some shimmer on her eyes because it's Thanksgiving and Hauck wants to sparkle. Bergdorf Goodman provided the wardrobe - a sweater and skirt, neither in denim. "I feel great," Hauck says.